Clutter in your home may reflect clutter you’re holding onto in your inner life. 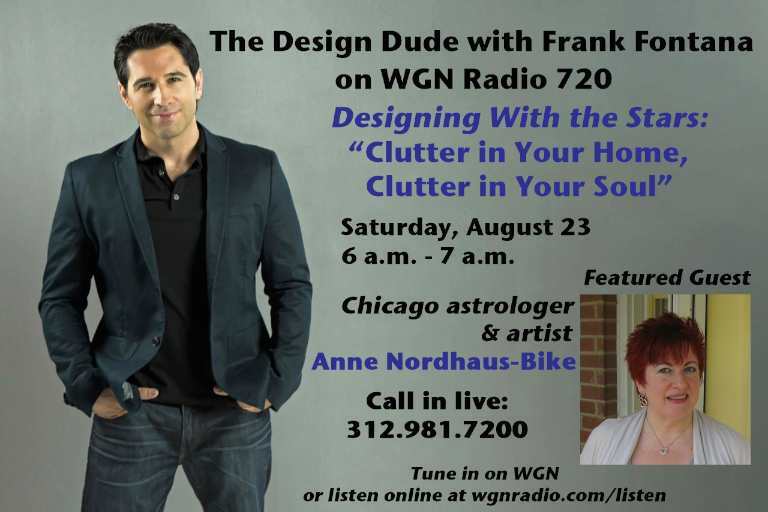 Get tips on how to get rid of the “Clutter in Your Home, Clutter in Your Soul” this Saturday, August 23, when Anne returns to Frank Fontana’s “Design Dude” show on WGN Radio AM 720 Chicago. Get key dates for planetary shifts during this year’s month of Virgo plus tips on how astrology can help you take advantage of this month’s special opportunity to clear out what needs to go from your inner and outer life by tuning in to WGN Radio AM 720 Chicago—online or on your radio—on Saturday, August 23, from 6 a.m. to 7 a.m. CDT. During the popular “Designing With The Stars” segment on Fontana’s top-rated show, you’ll hear design guru Frank Fontana tap Anne’s expertise as the two talk about current astrology and how to use it to make the most of your “inner home” as well as your outer home.